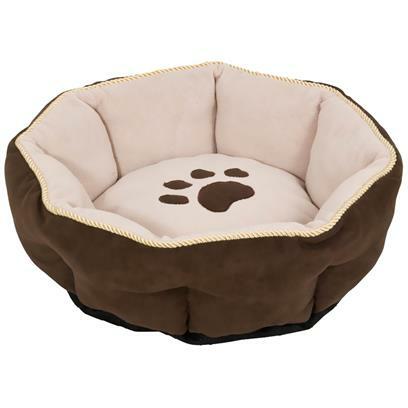 Aspen Pet Sculptured Round Bed (18") can rest comfortably while their pet parents rest easy, knowing that good pet beds are more affordable than ever! With Aspen value bedding, pet parents can get the style and comfort theyve come to expect at great prices. Ideal for cats and small dogs, the 18 round bed has a snuggly plush sleep area that will have pets nestling cozily! The high-loft, recycled polyester fiber fill will make pets feel like they are on cloud nine. The top edge of the bed is framed with elegant braided gold cording, and the exterior is crafted from a supple micro-suede fabric. Available in four colors to complement any home dcor: Black, Burnished Red, Espresso and Taupe. The bed is machine washable for easy care.